However, some divers have mistaken the data to mean that they should be cold to decrease their risk of DCS. This is not the case. Not only are they subjecting themselves being uncomfortable unnecessarily, but they also risk hypothermia. US Navy Experimental Diving Unit, Panama City, Florida, E-mail: john.r.clarke@navy.mil. The San Diego Center of Excellence in Diving at UC San Diego aims to help divers be effective consumers of scientific information through its “Healthy Divers in Healthy Oceans” mission. A 2007 research report from the Navy Experimental Diving Unit (NEDU) entitled “the influence of thermal exposure on diver susceptibility to decompression sickness” is leading some divers to think they should be cold if they want to reduce decompression risk. That is a misinterpretation of the report, and may be causing divers to miss some of the joy of diving. There is no substitute for comfort and safety on a dive. Gerth et al questioned the conventional wisdom that cold at depth increases the risk of decompression sickness (DCS). After conducting a carefully designed experiment, they were surprised to find that exactly the opposite was true. Some degree of cooling was beneficial, as long as the diver was warm during ascent. There are some important caveats for the non-Navy diver to consider. First of all, it was anticipated that a diver would have a system for carefully controlling their temperature during the separate phases of bottom time and decompression. Most non-Navy divers do not have that sort of surface support. Secondly, the ‘cold’ water in the NEDU study was 80⁰F (27⁰C). For most of us, this is an ideal swimming pool temperature, not exactly what you are going to find in non-tropical oceans and lakes. The warm water was 97⁰F (36⁰C), also a temperature not likely to be available to recreational and technical divers. When testing the effect of anything on decompression results, the Navy uses their extensive mathematical expertise to select the one dive profile that, in their estimation, is the most likely to identify a difference in decompression risk, if that difference exists. A 37 metres’ sea water (msw) dive with 25 to 70 min bottom time, decompressed on a USN Standard Air table for 37 msw and 70 min bottom time was selected. A total of 400 carefully controlled dives yielded 21 diagnosed cases of DCS. Overwhelmingly, the lowest risk of decompression was found when divers were kept warm during decompression. The effect of a 9⁰C increase in water temperature during decompression was comparable to the effects of halving bottom time. That is, of course, a remarkable result, apparently remarkable enough to cause civilian divers to alter their behavior when performing decompression dives. However, before you decide to chill yourself on the bottom or increase your risk of becoming hypothermic, consider these facts: • Do you have a way of keeping yourself warm, for instance with a hot water suit, during decompression ? If not, the study results do not apply to you. • Of many possible decompression schedules, the Navy tested only one, considered the best for showing a thermal influence on decompression risk. Although this result might possibly be extrapolated to other dive profiles, such extrapolation is always risky, especially if the planned dive is deeper and longer than that tested. • Most commercial decompression computers do not adhere to the US Navy Air Tables; few recreational dives are square profiles. Furthermore, additional conservatism is usually added to commercial algorithms. NEDU is not able to test the effects of diver skin temperature on all proprietary decompression tables, nor should they. That is not their mission. • The scientific method requires research to be replicated before test results can be proven or generalized. However, owing to the labour and expense involved in the NEDU dive series, it seems unlikely that any experiments that would determine the relevance of these results to recreational or technical diving will ever be performed. As such, it may raise as many questions as it answers. For instance, the original question remains; if you become chilled on a dive, how does that affect your overall risk of DCS compared to remaining comfortably warm ? Unfortunately, that question may never be answered fully. • Thermoneutral temperatures for swim-suited divers are reported to be 93-97⁰F (34-36⁰C) for divers at rest and 90⁰F (32⁰C) during light to moderate work. 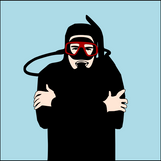 So a skin temperature of 80⁰F (27⁰C) is indeed cold for long-duration dives. If your skin temperature is less than this, then you are venturing into the unknown; NEDU’s results may not apply. In summary, beer and some wines are best chilled; arguably, divers are not. Diving physicians should be aware of this inappropriate practice. Coming Full Circle: Diving the O2ptima…again.